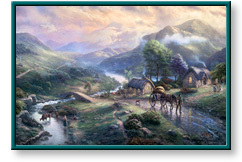 Emerald Valley and other artwork by artist Thomas Kinkade can be viewed in our artist slideshow. Emerald Valley by artist Thomas Kinkade and other Thomas Kincade art, art work, artwork, canvases, giclees, images, limited editions, open editions, paintings, paper, pictures, posters, and prints can all be found at Christ-Centered Art. "My family heralds from Ireland and I've long had a romantic attachment to the Emerald Isle. In Emerald Valley, I paint an ideal vision of the land of my fathers: Ireland. God's heavenly light pours from the skies on to the 'auld sod' — lighting a landscape so verdantly green that it suggests the bounty of nature unspoiled. "Emerald Valley is a timeless village scene. Here dirt farmers haul fresh hay; grannies tend the children, while mothers battle the housework. "Rocks are ripped from the earth to build roads and fences. The stone bridge heralds this rustic heritage. Waterways fill the valleys, making for a dramatic play of light between lakes and sky." Emerald Valley by artist Thomas Kinkade as well as other open and limited edition inspirational paper art prints and canvases, giclees, images, lithographs, paintings, pictures, posters, and reproductions by renowned Lightpost Publishing, Media Arts, and The Thomas Kinkade Company artist Thomas Kincade can be viewed and purchased at special sale prices at Christ-Centered Art.